Though less famous than the Lancaster, the Wellington was the backbone of the RAF during World War 2 (WW2). The Wellington squadrons at RAF Langham received their instructions from Coastal Command. Their job was to protect the ships of Britain and her allies from enemy naval vessels and aircraft and also to attack enemy shipping convoys. Flying at night, the planes were often alone on patrol for up to seven hours. ‘Seeing’ in the Dark Coastal Command made good use of them. During 1944 – 45 at Langham, 524 Squadron and 612 Squadron flew long, very cold patrols along the north European coast. Like Owls, they mainly hunted at night, developing special techniques to ensure success. 524 Squadron were based in Norfolk from July 1944. Previously they had been in the south west of England. They attacked enemy transport tankers, ‘E’ and ‘R’ boats, small coastal motor vessels and midget submarines. 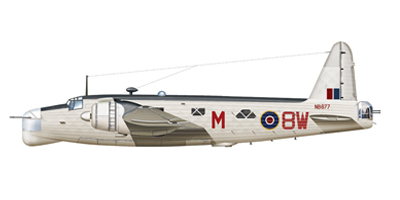 524 flew the Mk 13 Wellington. As its Mk 3 airborne surface vessel (ASV) radar used masts mounted all over the rear fuselage of the plane, it was nicknamed ‘Stickleback’, after the spiny fish. The technology enabled crews to ‘see in the dark’. But unfortunately, night attacks still remained generally ineffective. 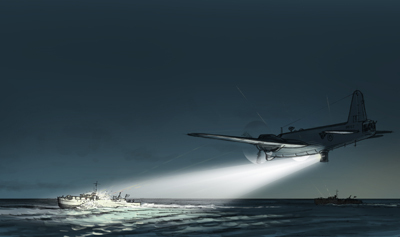 Without a Leigh Light, (as used by 612 Squadron) the crew could not see the target. The radar could guide them to within a mile of their objective but no closer. In October 1944, 612 Squadron arrived. Their newer Mk14 Wellingtons were fitted with the Leigh Light. This was a retractable searchlight which was lowered and shone onto the target. The pilot then had to fly by looking solely at his instruments since if he looked up he would be blinded by the light (A number of planes and their crews were lost in this way). The Mk14 also carried the very latest ASV radar – the Mk6, which brought them great success against the enemy. It could lock onto a target and hold, whatever the position of the aircraft. This meant they could drop a bomb with great accuracy even in the dark or in fog. There were understandable tensions between squadrons until 524 Squadron was fitted with the same equipment as 612. By April 1945, the enemy forces were squeezed up into northern Germany and Denmark. Many small ships were crossing the Baltic – presumed to be Nazis trying to escape with their loot. These small ships were the top target for 612 Squadron as the inevitable end of the war approached. The war in Europe ended on May 8th 1945. During the days following, the Wellingtons from Langham flew their ground crews on sightseeing tours over the battlefields of Europe. However, it’s little known that they also continued nightly missions until late June 1945. Fully armed, they were searching for any war criminals trying to escape by boat. A Wellington Mk14 attacks a patrol of enemy E - boats. © Ugly Studios. 524 Squadron Wellingtons carried torpedoes and Mk 3 airborne surface vessel (ASV) radar. They had black undersides, a colour scheme more usually found on Bomber Command aircraft. © Pete West. 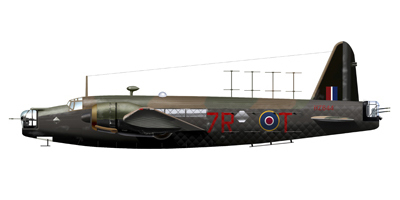 612 Squadron Wellingtons carried bombs or depth charges. A strange lump on the chin housed the scanner for the ASV Mk 6A radar system. They were painted a standard Coastal Command white. © Pete West. The Wellington squadrons’ attacks may have been cloaked by darkness, but they were still extremely dangerous. 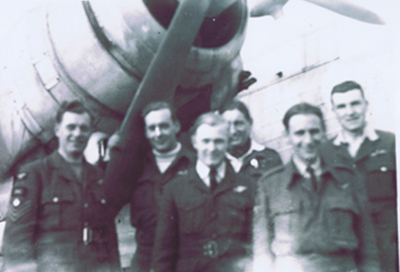 Peter Brewster (top left) an Air Gunner with 612 Squadron and his crew had an eventful mission on Christmas Day 1944. 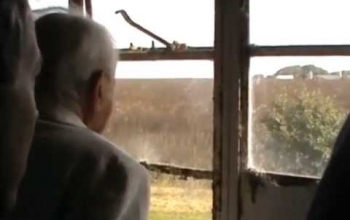 Their plane was hit fifty-seven times, landing back at Langham with fuel tanks patched with chewing gum! © Monica Kirkland and Richard Brewster. 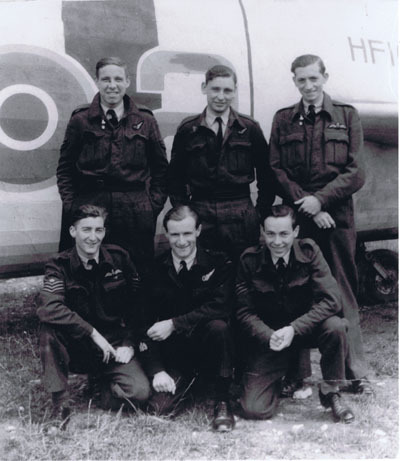 A 612 Squadron crew poses for the camera before a mission on the night of 8th May 1945. © Di Cornell. 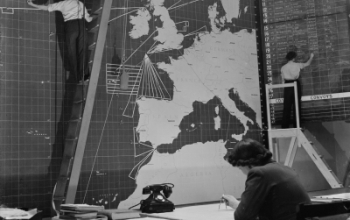 On some operations the Wellingtons’ job was to alert the Royal Navy to a target’s location. On others they enabled night attacks by Strike Wings, by dropping flares to light up the target. 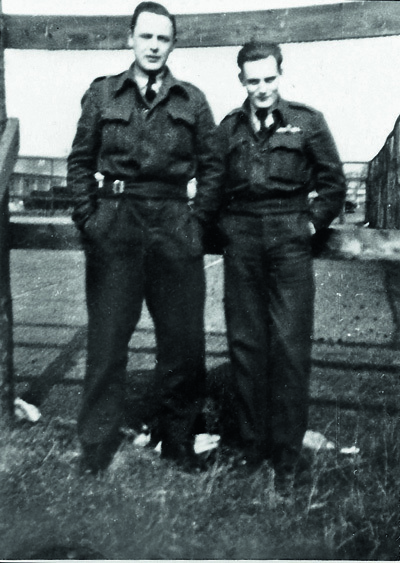 Gordon Willis (right) had been a Beaufighter pilot with 489 Squadron. Now flying a 524 Wellington, he sometimes marked targets for his old Squadron. © www.flypast.com.